Chiles en Nogada is a traditional Mexican dish made of poblano chiles stuffed with picadillo (a kind of hash, in this case consisting of a mixture of meat and dried fruit), covered in walnut sauce and garnished with pomegranate seeds and parsley. The dish is believed to have been invented in the 19th century by nuns in the town of Puebla. Since the dish has the colors of the Mexican flag and originated around the time of Mexican independence, it is considered one of Mexico's most patriotic dishes and is sometimes said to be Mexico's national dish, although generally that distinction goes to Mole Poblano. Agustin de Iturbide was a military commander who fought in Mexico's War of Independence and later went on to become Emperor of Mexico from 1822 to 1823. In August of 1821, he signed the Treaty of Cordoba, which granted Mexico its independence from Spain. The treaty was signed in the town of Veracruz on Mexico's east coast, and after signing the treaty, Iturbide traveled to Mexico City. Stopping on the way in Puebla, the townspeople decided to hold a feast to celebrate the country's independence from Spain, and to honor Agustin de Iturbide on his saints' day (the feast day of Saint Augustine of Hippo falls on August 28). The Augustinian nuns of Santa Monica convent wanted to prepare a special dish using local ingredients that were in season. They came up with the Chiles en Nogada, which means chile in walnut sauce. Chiles en Nogada is a seasonal dish. It is prepared and eaten mainly during the months of August and September, which is the time of year when the key ingredients, pomegranates and walnuts, are in season. Chile en Nogada season also coincides with Mexican Independence day festivities. Since this dish contains ingredients that are the colors of Mexico's flag - red, white, and green - it is considered a very patriotic and festive dish. If you happen to be in Mexico during Chile en Nogada season, be sure to sample this traditional Mexican dish. 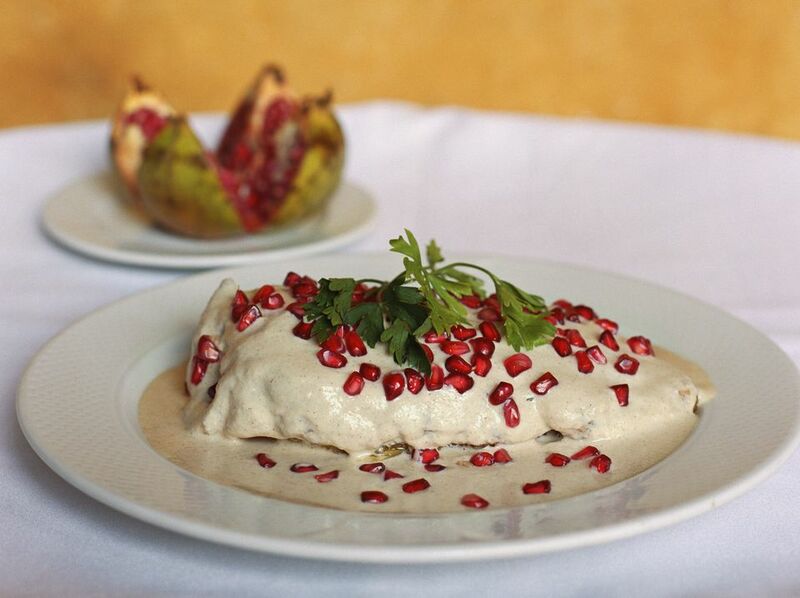 There are many restaurants in Mexico where you can order Chiles en Nogada during the summer and fall seasons. In Mexico City, good restaurants to sample this traditional Mexican dish are the Hosteria de Santo Domingo, or Azul y Oro. In Puebla, where the dish originated, the Casa de los Muñecos restaurant is a popular choice. If you like to cook, consider making your own Chiles en Nogada or try this vegetarian version. Read more about what to eat in Puebla.